CHiE! is a catalogue for the year-end exhibition curated by the students of Para/Site Art Space – Hong Kong Jockey Club Curatorial Training Programme. This publication marks the completion of the first edition of this training programme. The catalogue has been designed by Alexandre Ouairy. A poster is enclosed in the book. The book is edited by the two participants of the training programme, Jessie Chang and Jaspar Lau Kin Wah, as well as Christina Li. It reflects the exhibition hosted at Osage Foundation earlier this year. The project CHiE! – Culture sieges Politics exists not in a vacuum but within a variety of contexts such as curatorial, artistic, social-political and so forth. It embodies traces of concepts of connection, disharmony, multiple identities etc. Inspired by the different people the participants encountered during the curatorial training program and project research. The English title CHiE! is a word play on Che (Ernesto Che Guevara), the Latin American revolutionary figure, whereas the Chinese title of CHiE! is a quotation from Bull Tsang when he talked about the Citizen’s Radio that he managed. 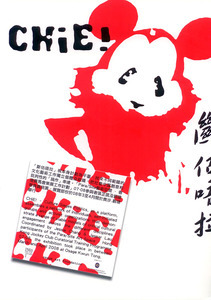 “Chie” also appeared in the animation film of McDull, Prince de la Bun, in which the certain proper Putonghua pronounication for students ended up indistinguished from a common Cantonese expression of dissatifaction.